Game three was going well until Reggie Jackson decided in the fourth quarter that he was tired of Peyton Siva Kim English Andre Drummond Peyton Siva guarding him and went off for 18 straight Oklahoma City points, dumping in shots from all over the court. This game looked reminsicent of so many of the Pistons' regular season games last year: three quarters of solid basketball in which they build a lead only to completely collapse for a quarter. At least KCP finally showed why the Pistons were so excited about him, and Andre Drummond was once again dominant, but all was for naught. Rumors of KCP's stiff back may hold some veracity. Before game three, there were rumblings that the Pistons' first-round pick was playing through a stiff back, and his performance yesterday leads some credence to that rumor. Gone were the shots that fly woefully long or careen off the side of the rim. KCP showed his typical defensive energy while pouring in 19 points on 13 shots to lead the Pistons in scoring. If this performance is more indicative of what KCP brings to the table, the Pistons may have gotten their shooting guard of the future. Drummond gonna Drummond. Another game, another double-double for Andre. 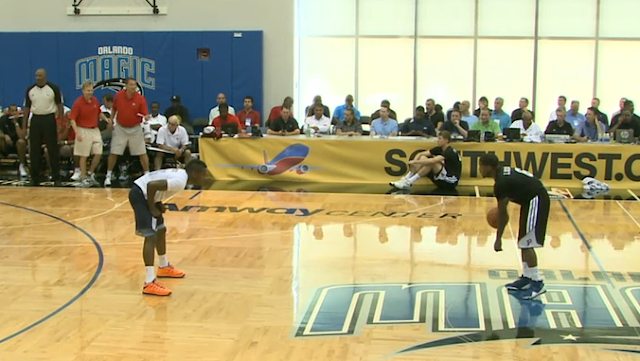 Before the Summer League started, Drummond was talking up his hook shot and post moves. In the first game, we saw him trying that hookshot to hilarious results. In this game, he once again pushed his limits, showing quick feet and finishing moves around the rim. The most impressive thing about Andre's game: 35 minutes played. 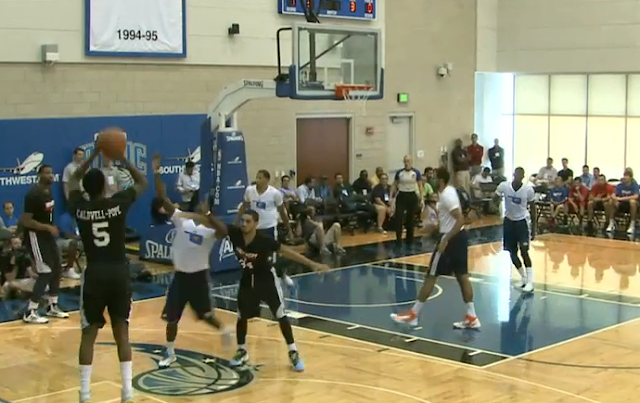 Drummond struggled with conditioning last year and in the first game of the Summer League, he was visibly gassed. In this game, he carried a high level of play throughout four quarters. Drummond's biggest weakness in this game was pick and roll defense. Oklahoma City opened up the floor for Reggie Jackson in the fourth quarter by using Drummond's man as the screener in pick and rolls. Andre stood in no man's land on defense, not hedging, switching, or staying on his man on the pick and roll. Jackson kept turning the corner and driving uncontested to the lane because Drummond was so far out of position. Peterson was often the screener in Detroit's pick and rolls during this game. In theory, Peterson stresses defenses by forcing them to account for him on pick and pop schemes, not unlike Charlie Villanueva last year. Missing shots doesn't inspire fear, though, and as Peterson continued to brick outside shots, the Thunder defense began ignoring him. Europe calls etc etc. English was one of the culprits during the Reggie Jackson Takeover Hour. Without more consistent shooting, English will find it hard to earn playing time if he manages to make the roster at all. After a third straight mediocre performance, don't expect to see English much this season. The box score says this was Siva's best game of the Summer League until you look at Reggie Jackon's stat line. Jackson scored 35 points on 12-19 shooting. For a player who's reputation is his defensive prowess, getting torched this badly is a bad sign. Siva struggled offensively throughout the Summer League but always kept his head above water by shutting down his matchup. This game was a reality check for where Siva is in his development. Mitchell didn't do much of anything in this game. He began on the bench for the first time in the Summer League and failed make an impact on either side of the court. His defensive prowess and intimidation are not what they were in the first game and he's struggling to find a place in the offense. Maybe next year? With another team? They each hit a shot in this game, at least. With the signing of European small forward Luigi Datome earlier today, the Pistons roster is more or less set. none of the reserves will make the Pistons (not that any of them would have anyway). And at 1-2, the Pistons are eliminated from playing for the Summer League crown. Drummond likely won't play on Thursday, which should serve as a final showcase for KCP, Mitchell, and Siva.